At the beginning of the week I loaded Mr. Forester (my Subaru who also goes by the name “silver fox”) with sleeping bags and long johns and friends and headed to the woods. The drive itself was beautiful. We passed through Appalachian farmland, admiring the weathered barns sliding drunk from the hillsides and the empty pastures with their solitary tree swings and watchful grazers. This is the time of the year for which the Blue Ridge Mountains are named. With the trees still bare, the gently rounded peaks of these ancient mountains remain cloaked in a dusky blue twilight. We drove straight into their folds. By the time we hiked up into the woods, it was already mid-afternoon. Unlike time’s normal routine of skittering past your grasp and forever down its rabbit hole, this bright day just seemed to get bigger and bigger. Sometimes, when you really lose yourself in nature, time stretches so thin it almost ceases to exist. We spent long, sun-dappled moments swimming in the cold mountain river, leaping from one boulder of moss to another and exploring the awakening forest. 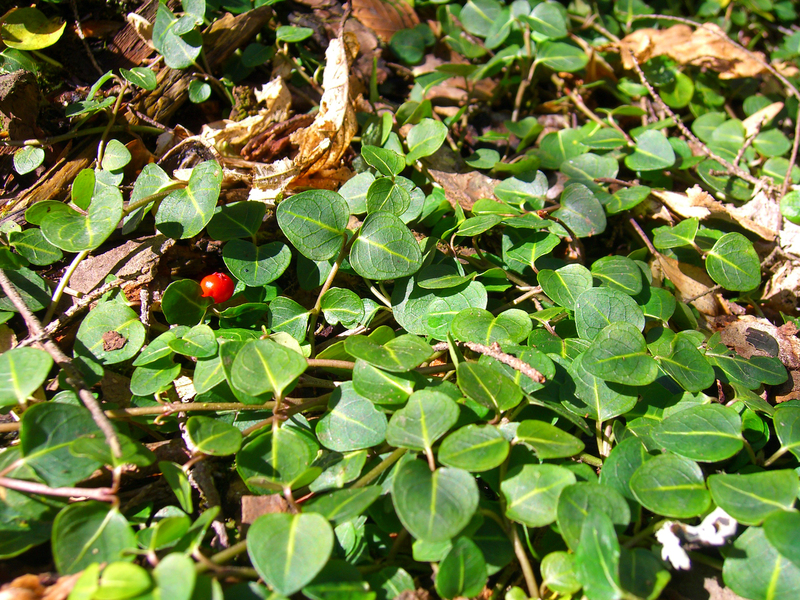 I got lost for hours laying in a bed of partridge berry. This lovely, creeping evergreen dripped from rock faces, tree roots, and rhododendron shade everywhere. It was profuse. An incredible native medicinal, I leisurely collected handful upon handful as the day drew on. (If you want to know more about this humble and powerful plant, check out Juliet Blankespoor’s awesome post on her blog Castanea). 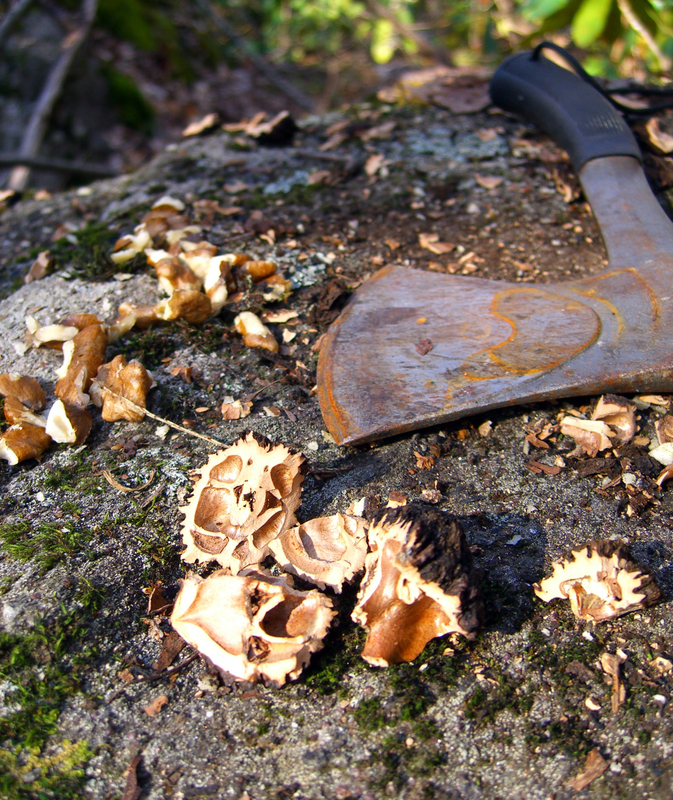 We snacked on black walnuts (gathered this past fall by many friends with black hands!) and ate dried wild apples. That night we cooked local deer and wild rice (harvested, danced upon, and carried back to Appalachia all the way from Minnesota) over an open fire. We rolled our sleeping bags out on the ground, spent one last moment looking up at the black silhouettes of the trees, and then fell asleep under the stars. In moments like these, I can’t help but be left in wonder. How charmed life can be. Your writing gives me goose bumps. It’s sublime. Thanks dad. Yes, Mr. Forester is still being taken to his regular checkups. In fact, he saw the jiffy lube doctor the very morning of this trip.